Cataracts and AMD, or age-related macular degeneration, are two common eye diseases that can impact a person’s vision and, ultimately, quality of life. These conditions most frequently affect older individuals, and are especially common in those aged 60 and over. While cataracts describe a clouding of the natural lens that makes it difficult to see clearly, AMD effects the retina. Each condition has a unique effect on the vision. Cataracts cause a general blurriness and loss of contrast, and AMD directly impacts a person’s central vision. Neither condition has a cure, but each can be treated or managed so that patients can preserve clear vision. The question, though, is how to treat a patient with both cataracts and AMD. At his Detroit, MI eye care center, Dr. Thomas Byrd considers the unique needs of each patient to personalize a treatment plan that will restore vision and improve quality of life. Age-related macular degeneration develops in two forms: dry and wet. Dry AMD is far more common. This condition progresses as the light sensitive cells in the macula (a collection of tissues at the center of the retina) begin to break down. Dry AMD cannot be cured, but evidence suggests that certain nutritional supplements can slow the progression of this disease so that patients can enjoy clearer vision for longer. Unfortunately, once dry AMD has reached its advanced stages, there is nothing that can be done to restore central vision. Wet AMD is far less common than dry AMD, but it progresses more quickly. Wet AMD, which develops when the blood vessels in the macula begin to leak, can have an immediate impact on central vision. Like dry AMD, this condition cannot be cured, but it may be controlled through medication and laser therapy. Cataracts are a progressive condition that will continue to worsen. There is no treatment to stop or slow the development of cataracts, but treatments are available to preserve and restore vision. When cataracts are in their early stages, they can usually be managed through the use of prescription lenses. However, as cataracts worsen, surgery is the only effective treatment. Cataract surgery involves removing the natural lens of the eye and replacing it with an intraocular lens that acts much like a permanent contact lens. Cataract surgery can greatly improve patients’ vision so that they can continue to perform daily tasks with ease. Will Cataract Surgery Hurt or Help AMD? Some patients suffer from cataracts and AMD at the same time. Although cataracts can be effectively treated through cataract surgery, many patients question how this procedure will affect AMD. Cataract surgery has the potential to cause swelling in the retina, which, theoretically, could accelerate the progression of AMD. However, studies have consistently shown that, in actuality, cataract surgery does not seem to have a negative impact on AMD. 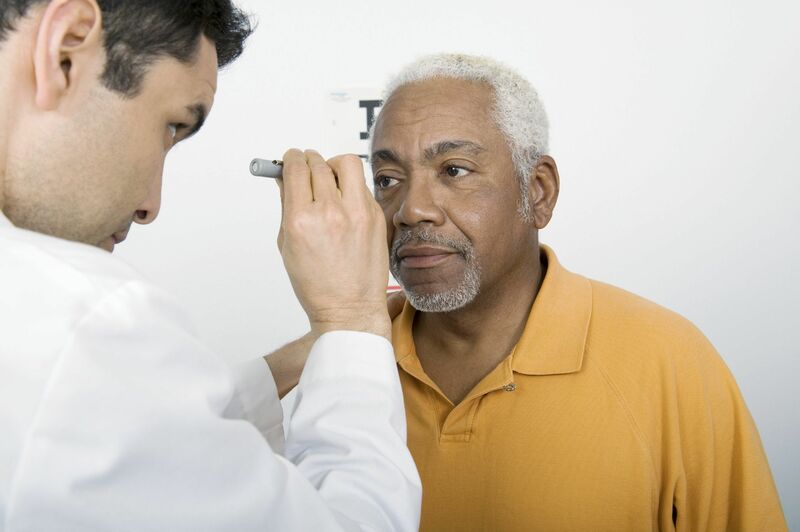 Patients should be aware, though, that if cataracts were thick enough to mask symptoms of AMD, visual abnormalities may be more obvious after cataract surgery. While cataract surgery is not known to hurt AMD, it does not cure the condition either. Cataract surgery strictly addresses issues with the lens of the eye, while AMD is related to the retina. However, it is important to note that patients with AMD who undergo cataract surgery may still benefit from somewhat clearer vision. Since AMD effects the central vision, many people with this condition rely on their peripheral vision. Cataract surgery will improve peripheral vision, which can make it easier for those who have suffered from AMD and cataracts to perform daily functions. Overall, cataract surgery can effectively treat a clouded lens without impacting AMD or worsening the condition. Although central vision will still be compromised by AMD symptoms, patients often find that it is still worthwhile to treat cataracts so that they can at least restore some peripheral vision. Dr. Byrd is happy to discuss more specific treatment options with patients. If you are suffering from cataracts and AMD, and are wondering how to best manage these conditions and preserve your vision, Dr. Thomas Byrd can help. Contact us at your earliest convenience to learn more about cataract surgery, and whether you may be an ideal candidate for this procedure.